As one of the subsidiaries of Hotai Motor (distributor of TOYOTA/LEXUS in Taiwan), HFC is a comprehensive finance service company with strong stakeholders in place including Hotai Motor (No. 9 on top 650 of service industry) and Toyota Financial Service Corporation. Since its establishment in 1999, HFC has continued to expand multiple installment businesses for new vehicles, commercial vehicles, used vehicles, motorcycles and car refinance loans to provide diversified financial services to customers. Meanwhile, it also extends installment business to corporate equipment leasing, offering customized corporate financial services. To expand its international presence and serve Taiwanese companies in Taiwan and China, HFC has worked with its affiliated company Hotai Leasing to create a cross-border cooperation blueprint. The first step was to establish Hoyun International Lease Co., Ltd. jointly in Shanghai, China in 2007, providing vehicle, machine and equipment leasing services which has allowed local Chinese and Taiwanese companies to better use its funding and get better support in operation development. 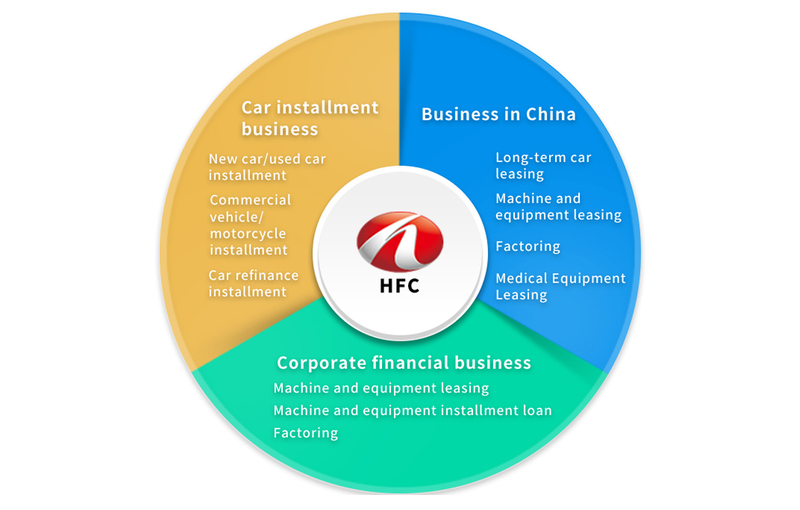 HFC advocates the management philosophy of "Customer First, Profession Based", hoping to convey the message of the "management philosophy of customer first and continuous improvement" and "management resolution of thorough execution" besides the existing customer awareness of TOYOTA brand and market leader idea. HFC also pursues best performance and applies to several aspects of customer service, supporting every customer to achieve outstanding quality of life. For social responsibility, HFC creates reasonable industry order and principle and cares people and environment. For the future, HFC will head toward sustainable development and create more diversified and higher quality products and services to enrich customers' life.